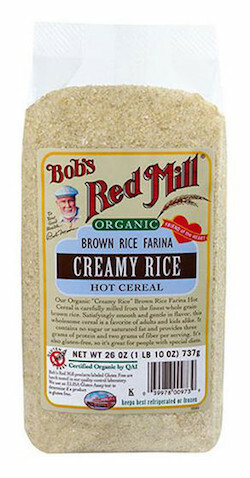 Bob's Red Mill "Creamy Rice" Brown Rice Farina Hot Cereal is whole grain cereal at its finest. We take the finest California brown rice and cut it into a few pieces to create a satisfyingly smooth cereal with a mild flavor. This wholesome cereal is a favorite of adults and kids alike. It's also gluten free, so it's a great alternative for people with special diets. Whole grain brown rice is high in protein, iron and fiber. Rice is notoriously easy to digest, making this cereal perfect for those who have digestive issues and is great for little ones who need something simple, yet nutritious in their tummies. "Creamy Rice" Brown Rice Farina makes a delicious and satisfying hot breakfast cereal or add chopped green onions, mushrooms and your favorite spices for a unique alternative to potatoes at dinner. Brown rice farina can be very sticky and is a fun alternative to polenta or grits in your favorite recipes.